Hosting is the more important component for the web publisher to store data of website. You can get free unlimited free hosting with Blogger platform from google only. If your are going to make other any platform you need to buy any package of hosting from Provider. 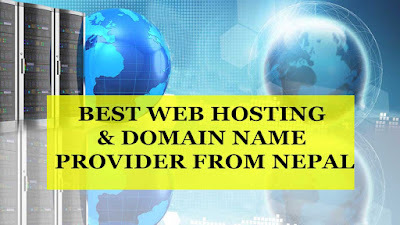 Today we are going to introduce about top 8 web host and domain provider targeting Nepal. Mercantile Communications is the best Internet Service Provider in Nepal. its famous for Dot NP domain They provides .np domain free of cost. which is located on Kathmandu Nepal. To get .np domin name you need to apply with id or Company Registration Card . Mercantile Communication Provides Hosting too you can buy hosting for your site. it was established on 1-Jan-1994. Oho Domin is the another best hosting provider of nepal hosted by Shiran Technologies Pvt Ltd Hattisar Kathmandu. ohodomain offers cheapest domain & web hosting in nepal for verities of web platform. World link is famous internet provider of nepal. they also offering Web and Domain Hosting with cheap price. Worldlink located on Jawalakhel, Lalitpur Nepal. They are giving service since 1-Jan-1995 all over the nepal. Web Host Nepal is an recently owned company powering more than 5000 websites at New Baneshwor Kathmandu Nepal. You can make your choise to buy hosting and domain from WebHost Nepal. eHosting Server also offering Best Web Hosting and domain registration in Nepal at cheapest price. which is located on Balkumari-9 Ring Road Kathmandu Targeting US and Nepal. Himalayan Host was established on 2007. they are providing reliable and long standing force in the Web Hosting Industry. Himalayan host located on New Banshwor Kathamndu. HostNep Network also provides all kind of web based solutions to Personal & businesses Platform From New Baneshwor Kathmandu Nepal . Host Nep targeting Nepal, United Kingdom. Websoft Technology Nepal is a company located in Srijana Chowk, Pokhara . They delivers various information Technology services including hosting,domain registration and cloud services at cheap Price.